1. Wire transfer - postage fee of 2,50 EUR. After Your order has been confirmed, we will send an invoice to You via e-mail, based on which You will pay for Your order. After receiving the payment, we will send Your package to the address You have previously specified. 2. Cash on delivery - postage fee of 3,30 EUR. You will pay for Your package upon pickup at the post office. 3. PayPal - postage fee of 2,50 EUR. After receiving the payment, we will send the package to the address You have previously specified. 4. In person - no postage fee. After a previous telephone arrangement, You will pick up and pay for Your order directly in the Patchwork hobby art shop. The Postage fees mentioned in article 1, 2 and 3 are valid only within the territory of Slovak Republic. Worldwide deliveries - The actual postage will be determined according to the destination country and respective Slovak Post charges. Please inquire about the actual shipping price via e-mail prior to ordering. The automatically generated confirmation about Your order being received by our electronical system, which will be sent to your e-mail address immediately after the order has been placed, is NOT considered an order confirmation. Only a message confirming the processing of Your order constitutes the actual order confirmation. We try to process Your orders as soon as possible, typically within 3 to 5 working days from the order confirmation (or money receival, when paying by wire transfer). a/ By the shop (from our side) We reserve the right to cancel Your order of goods which we are unable to ship because of their unavailability, or which we are unable to ship within the time specified by these terms and conditions, or for a price specified in our e-shop; unless a different arrangement is made with You as the buyer. We will inform You about any order changes by e-mail or by telephone. In case You already paid for a cancelled order, the sum in question will be returned to You within 7 working days by wire transfer to an account of Your choice. b/By the buyer (from Your side) It is possible to cancel Your order within 2 hours from the time of its confirmation. 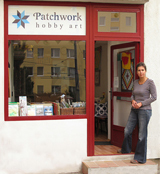 To do so, send an e-mail with a subject of "CANCELLATION" to patchwork@hobbyart.sk. Also, be sure to include Your contact details AND telephone number within the e-mail. If You have already paid for Your order and have cancelled it within 2 hours from the time of its confirmation, a refund will be wired to Your bank account. In case You are not satisfied with the goods You have received, You can return them within 14 days from the day of receival. In that case, contact us, please, via e-mail (patchwork@hobbyart.sk) or telephone (0903 212 356). We will send a return form to your e-mail address. The goods You want to return have to be intact and accompanied by proof of purchase. Please include the original packaging too. After returning, the price of the goods and of the shipping fee paid on checkout will be refunded to You within 14 days from receival of the returned goods, using the same payment method You used for the order. As the consumer, You are obliged to send the goods in question back to the seller within 14 days after cancelling the order or return them in person to the seller or the person responsible for returns within said period. These conditions do NOT apply for magazines and literature; which cannot be returned. A 24-month warranty applies to all goods. This warranty does not apply for faults caused by mechanical damage to the goods, improper handling or use, or use in inappropriate conditions. The sales return has to be placed within 3 days from the day of receival of the goods, via postal service or e-mail. The sales return must contain information about the nature of damage or faults and a copy of sales invoice or cash ticket. The returned goods have to be enclosed in the original packaging. The seller is obliged to deal with the return immediately, or within 3 days in complicated cases. This time, however, does not include the time needed for a specialized fault check. The sales return must not last longer than 30 days. After this period has expired, the customer possesses equal rights as if there was a fault that cannot be removed. Send your written sales returns to this address: Dagmar Méresová, Pod Rovnicami 9, 841 05 Bratislava. We do accept solving possible (buyer-seller) disputes via Online Dispute Resolution website: http://ec.europa.eu/consumers/odr/index_en.htm.